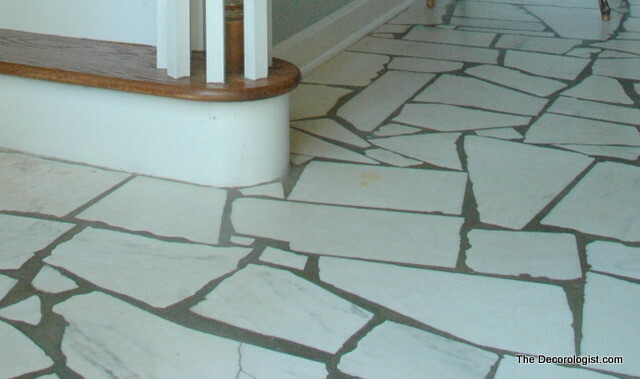 This client had grown weary of her dark, dated entry but wasn’t sure she wanted to completely redo the floor. I knew I could work with this floor (and jackhammering it up would be NO FUN). But the green carpet on the stairs had to go. 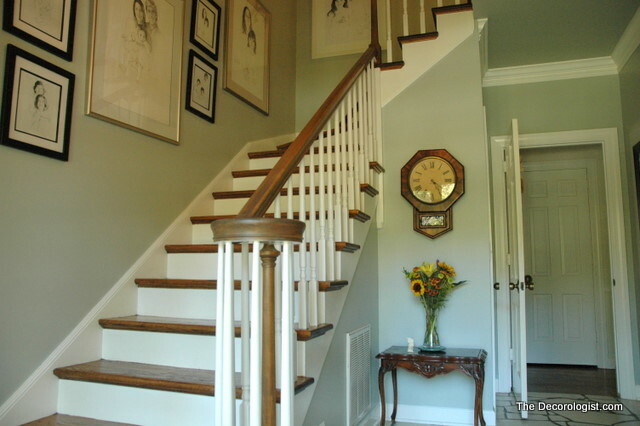 I recommended removing the carpet to reveal the hardwood beneath and painting an airy gray-blue Benjamin Moore paint color to lighten the space and to complement the existing entry flooring. I think the floor looks fabulous now – I wouldn’t remove it if I could! I rearranged the art grouping that climbs the wall going up the stairs. 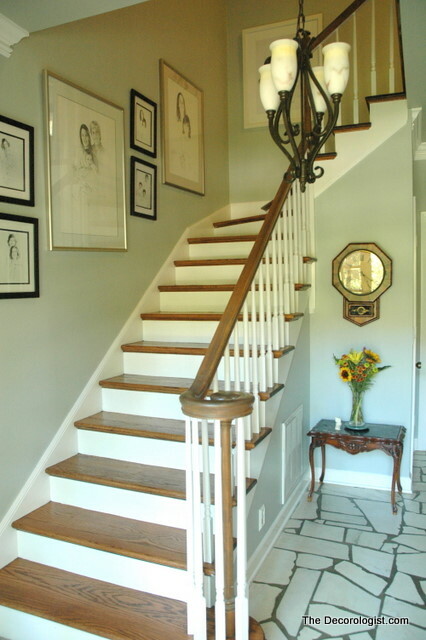 Those black and white sketches are perfect for this space and very significant to the family who lives here. 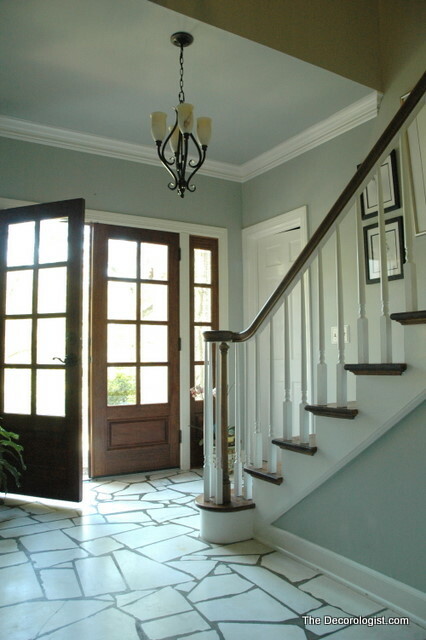 Isn’t it amazing what a difference the right choice of paint color can make? Some designers encourage their clients to rip out all the existing finishes and furnishings and start all over. 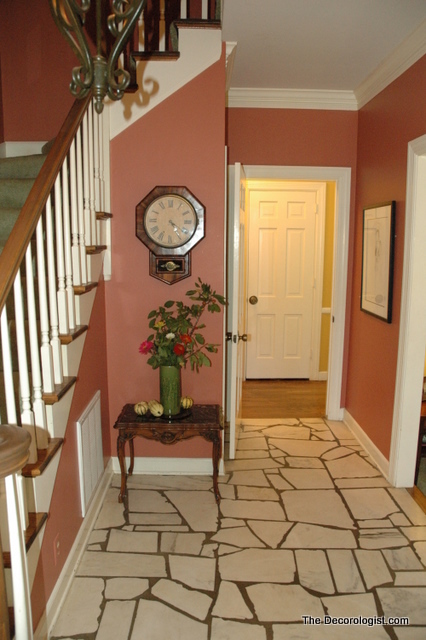 Here we were able to use the existing entry floor, art, and accessories and still managed to make a huge positive change by uncovering the beauty beneath that carpet and choosing the right paint color. Sometimes, wisdom is knowing what to change and what NOT to change. 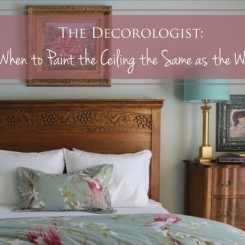 If you’re ready for a positive change in your homelife, contact The Decorologist for your Decoration Consultation today! 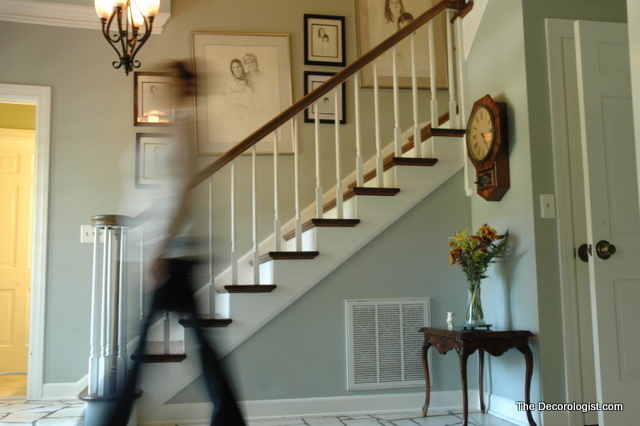 This entry was posted in Design Intervention and tagged benjamin moore, blue, blue entry, blue paint, blue room, carpeted stairs, choosing paint color, dated flooring, decorologist blog, designer, gray, gray entry, gray room, marble floor, nashville designer, paint, paint color, slate floor, the decorologist, updating, wood stairs. I’ll admit when I saw the first picture I sheepishly thought, “I actually kinda LIKE that floor.” So glad you kept it – it looks awesome! It’s all about context, right? 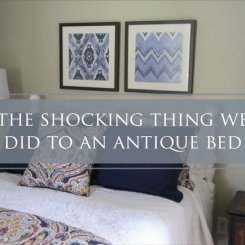 My client disliked it to the point that she had a big rug covering up as much of it as possible the first time I saw her house. The previous wall color made the flooring scream a little, while the new color scheme makes the floor quieten down a bit and appear more sophisticated. Kristie, I too love that floor. What you did with that entry is amazing. The new wall colour is perfect for that space. Just beautiful. Like everyone else, I liked the floor, too. But, now it’s absolutely gorgeous! I love the floor too, and it looks SO much better after your makeover! I am so impressed with your post….what a transformation!! It’s amazing what the RIGHT design advice can do for a space. Keep them coming!! Love it! What a great before and after! I must say though I have never seen a floor that looks anything like that…must be a Southern thing. Smart! I think your choices where right on. Why waste money when you can make it work? Bravo! Your client must think you “walk on water”! Great job! So true, Kristie! Sometimes we just have to take the time to *see* something’s potential. So often we completely dismiss something that seems to be the problem but really isn’t. The after looks amazing. Great job. I’m sure your clients are thrilled. The floor, which I had never seen before (that type of tile), does look a lot better with the changes. yikes! i panicked when i thought your were going to tear out that floor—i love it! but, phew, you saved the floor and their foyer! well done! Love love love! 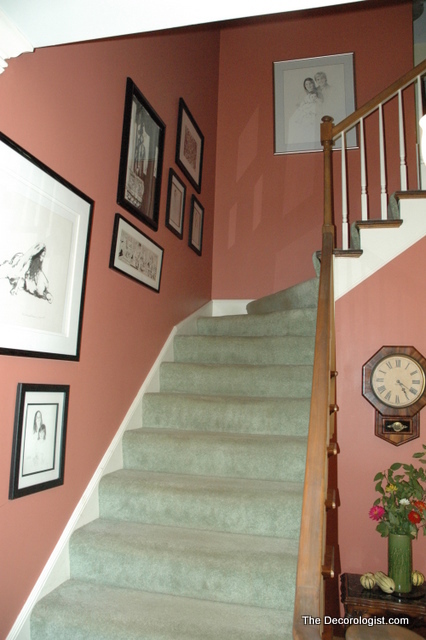 What a gorgeous color… and those STAIRS! Sometimes it is best to just go with the flow, eh? Hi Kristie, It’s my pleasure to feature you again in my “FAB FRIDAY FAVORITES” post tonight. Thanks so much for linking up to my party – I know my readers love to see what you’ve been up to! Wow! So fresh and bright, I love it and I am glad you didn’t change the floor. I like it! Wow, that looks really fantastic! Great job. As someone who loves vintage things, I really appreciate your not only finding a way to keep that original floor, but to make it look really fab. Wonderful! My mother had the grout in her entry painted a medium beige. It lighten up the whole entry and now looks updated and fabulous!